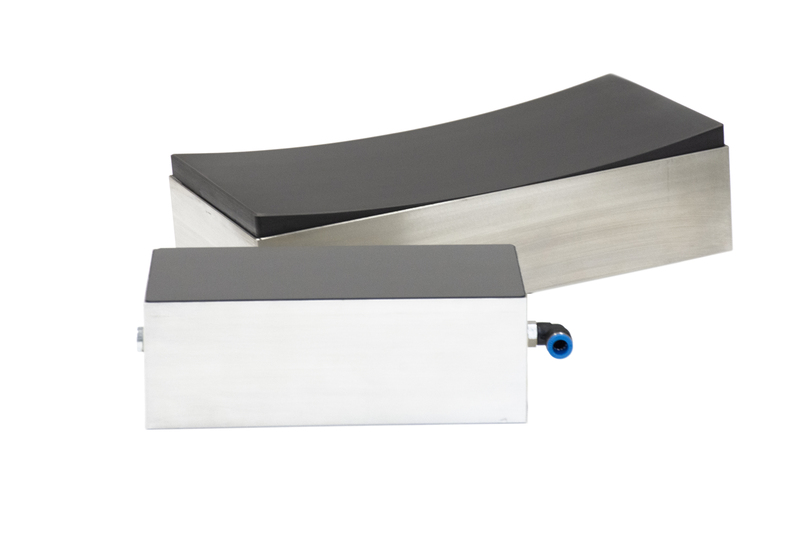 Externally pressurized air bearings, commercially available from New Way Air Bearings, enable new designs that allow for higher rotation speeds, improved precision, and larger center apertures needed for advanced Computed Tomography (CT) scanner applications. CT scanners are rotating X-ray machines. By rotating the X-ray source and detector (arranged 180 degrees across from each other) around the object of interest, it is possible to build a three-dimensional image. Medical applications are one of the early and most common applications, but baggage scanning for explosive devices in airline baggage is another big application. In both these applications, it is advantageous to have as large a center aperture as possible to fit odd shaped luggage or patients arranged in poses to keep arms from obscuring a 360-degree view of internal organs. Also, many patients have claustrophobia in small confined apertures making it difficult for them to remain still through the procedure. So, most machines require an aperture diameter of at least one meter (Figure 1). Because these machines image only a small slice each time around, they need to rotate at hundreds of rpms to have the procedure be short enough for patients to tolerate it, or to keep up with the many checked bags that need to be scanned in the airline business. Additionally, the X-ray equipment, on the order of 1.5 metric tons, is cantilevered off the bearing by half a meter and is not symmetrically arranged. This makes for a difficult bearing specification. Rolling element slewing ring bearings have been the common choice of machine designers. 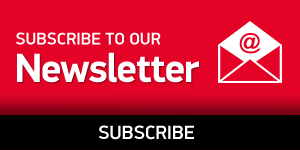 In order to optimize the lifetime of the bearings they have been located at the smallest possible diameter to minimize speed of rotating elements and lifetime distance traveled. Unfortunately, this limits the size of the center aperture and puts the relatively noisy bearing near the already nervous patient. The need for speed continued to push CT machine designers, especially in the medical area. CT scanners for imaging the heart are especially challenging, because of the natural motion of the beating heart. 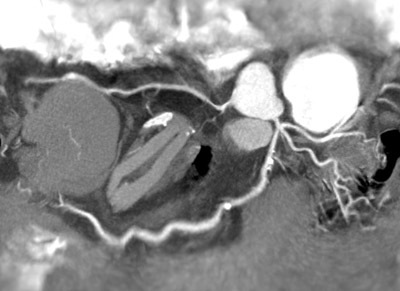 This procedure, known as Cardiovascular Computed Tomography Angiography (CCTA) is a growing application. In this case, the X-ray equipment needs to get around the heart between beats, while the heart is at rest, in order to image the fine blood vessels feeding blood to the heart muscle itself (Figure 2). There are only two options: slow down the heart through sedation or speed up the rotation of the machine. Philips Healthcare, a major supplier of CT equipment began a new machine design with a fresh sheet of paper in order to find a way to speed up the rotation. 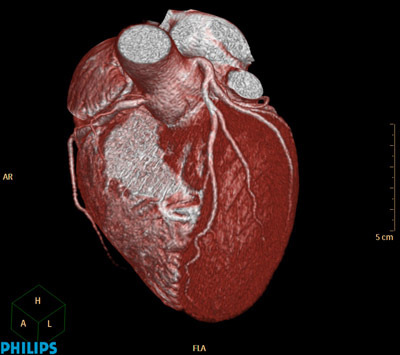 According to Philips Healthcare CT Product Manager Robert Popilock, their clinical partners were “interested in performing CT examinations of the heart, requested a system capable of faster rotation speed to improve the likelihood of capturing a “snapshot” (Figure 3) of the vessels supplying blood to the heart wall at the most quiet state.1 ” The solution they found also solved many of the other problems of building precision CT scanning equipment. 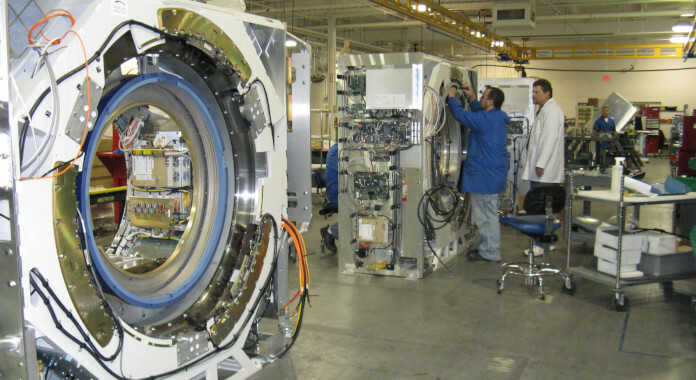 They started to evaluate air bearings for support of the rotating X-ray equipment. Air bearings have speed limitations far in excess of the speeds they needed. In fact, neither speed nor travel distance are factors of wear in an air bearing system, thus improving reliability and reducing the cost of ownership for their customers. Still, there were more advantages; there was no need for periodic oil lubrication, no oil contamination of other system components, and no smell from the warm oil. The air bearing was entirely silent and could be located at the perimeter of a much larger ring. This avoids the sound and vibration of the 1-meter rolling bearing at over 200rpm carrying the 1.5 tons of equipment only inches from the patients face and increasing their heart rate. The air bearings were able to support a 1.68-meter diameter race at the perimeter, well away from the patient and at 220rpm giving 1 rotation every .27 seconds. This was fast enough to image the whole heart during a resting phase and met the requirements of the project. During the development phase of the machine, a fully loaded 2m diameter race was spun at 500rpm successfully. This is in excess of 50m/s at the bearing and resulted in a revolution every .12 seconds. This speed though exceeded the centrifugal force that the sensitive X-ray source can withstand and was faster than needed. But the bearings were no longer limiting the machines performance. The bearings were also crash tested during this development phase. At 300rpm the air supply was turned off intentionally, letting the fully loaded 2-meter diameter rotor land on the bearings without air supply and come to a stop from Coulomb friction. This was done not once, but 100 times. 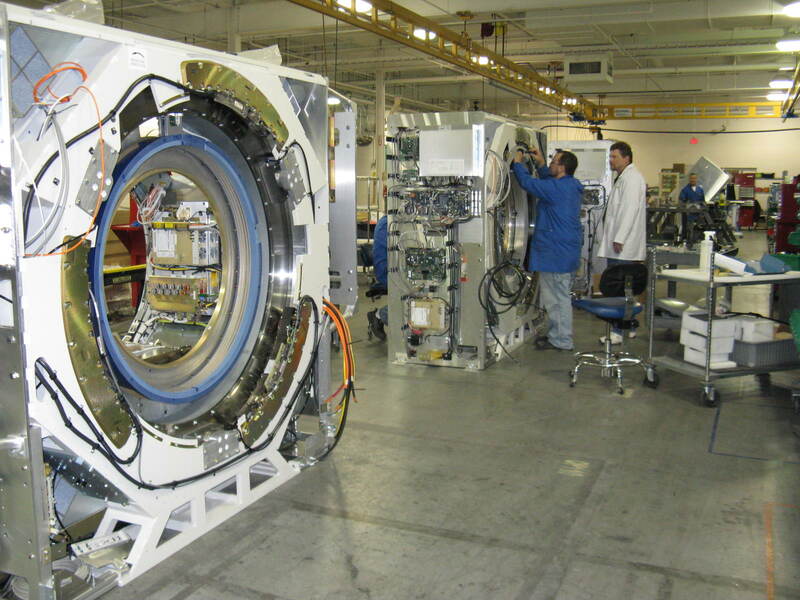 After this endurance test, the air bearings still operated as they had prior to the test. This proved out the lubricity and non-scoring nature of the porous carbon air bearing faces provided by New Way Air Bearings and was an important confidence builder for Philips Healthcare. Still, there are more advantages to air bearing systems, one being increasing the resolution of the system over the rolling element bearings. This became apparent during the measuring of the precision of the axis of rotation. Axis of rotation metrology is defined in the standards under ASME B89.3 4-1958 (“Axes of Rotation, Methods for Specifying and Testing”) and ISO-230-7 (“Geometric Accuracy of Axes of Rotation”). 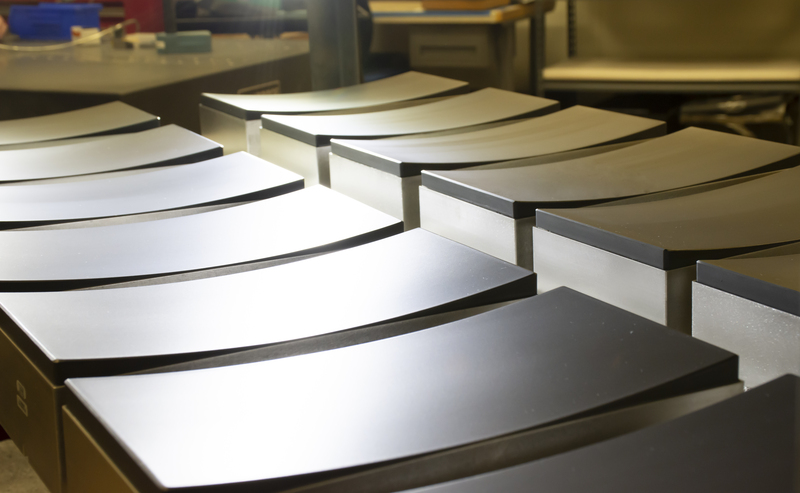 These are the standards used to qualify the likes of roundness measuring machines and precision machine tool spindles. Targets are mounted on the rotating part and precision sensors (usually capacitance probes) are used to measure axial and radial displacements (Figure 4). Although both the air bearing and rolling element systems have error motion, rolling element systems have relatively high asynchronous errors. These are errors that are different every time around and result from the fact that rolling element bearings have more than one rotating component. For instance, the rotating race is not perfect, neither are all the rollers and because they precess in the outer race with different frequencies they are in a different relative position each time around.This results in asynchronous errors that, by example in other applications, are associated with surface finish limitations in single point turning or roundness errors when grinding large gears that only rotate a few times.2 In CT scanning using rolling bearings, the issue is that at a given speed the source and detector are in a slightly different place relative to the patient in each rotation. The air bearing system though has only one rotating bearing element. So, although there are synchronous errors, these errors are the same each time around and based on the shape of the rotating race, at least the source and the detector are in the same place each time around relative to the patient. This improves the image resolution capability of the air bearing system. This conversation about precision leads to other cost and bearing life issues. 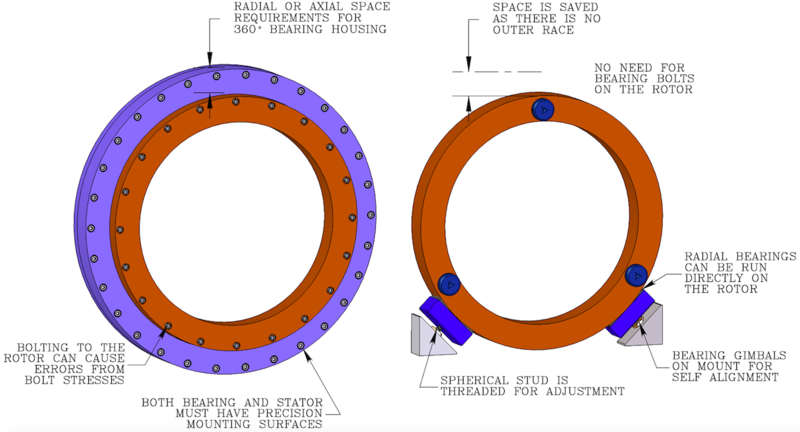 Large roller bearings or slewing bearings require a continuous and precise mounting surface on the stator to receive (and since nothing is perfect elasticity average) the mounting of the precision machined stator side of the bearing. The same precision surface is required on the rotating component being supported that bolts to the rotating bearing race. 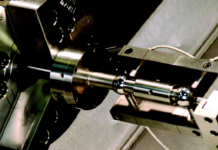 Machining inaccuracies in any of these surfaces can cause huge increases in the Hertzian contact stress of the rolling elements and raceways. 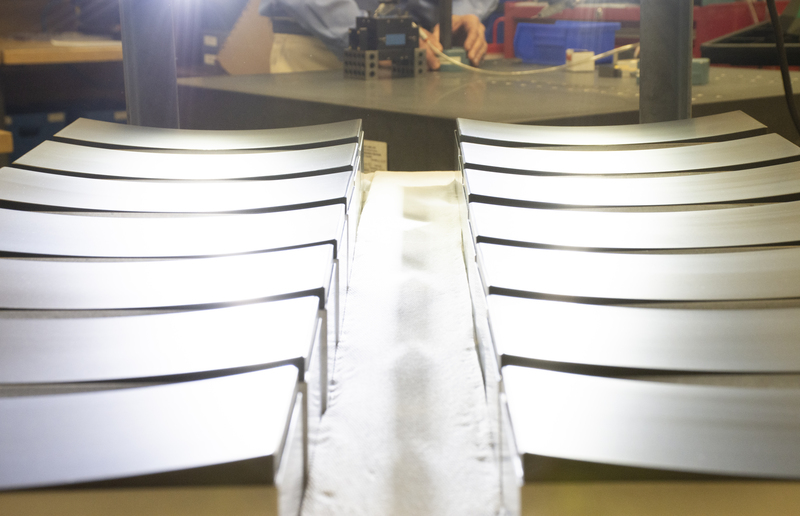 Precision surfaces on large components are both a cost and supply chain issue, but the issue does not end there. There is a tension between the desires of light weight and high precision. 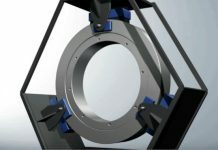 A medical scanner cannot be designed with the stiffness and mass of a metal cutting machine tool, it would fall though a hospital floor, so when a medical scanner stator is machined on a vertical axis machine tool it may be near perfect, but stand it up in its horizontal axis operating condition and that precision surface may well change, mount the rotating component and 1.5 tons of asymmetric mass off that precision surface and the surface will certainly change, now spin that mass at over 200rpm and it will make the bearing races oval instead of round, splaying them open on the cantilevered mass side. 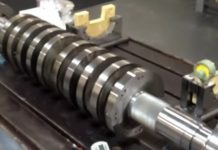 This exacerbates the asynchronous precision issue discussed above and causes the bearing manufacture to build in more “safety factors” and cost to avoid premature failures. When we consider the air bearing alternative employed by Philips Healthcare, yes, the larger rotor costs more than the inner race of a rolling bearing, needs precision machining and is subject to the same loads of as rolling bearing but there is no stationary race. The air bearings require just two relatively small and light radial air bearings supporting the rotating mass, so the stator does not require precision machining (Figure 5). These air bearings mount on self-aligning features so their faces align naturally to the rotor surface. These air bearings are also kinematically correct, so exact force paths are known through the bearings and into the stator structure simplifying FEA analysis with neat and closed equations (Figure 6). 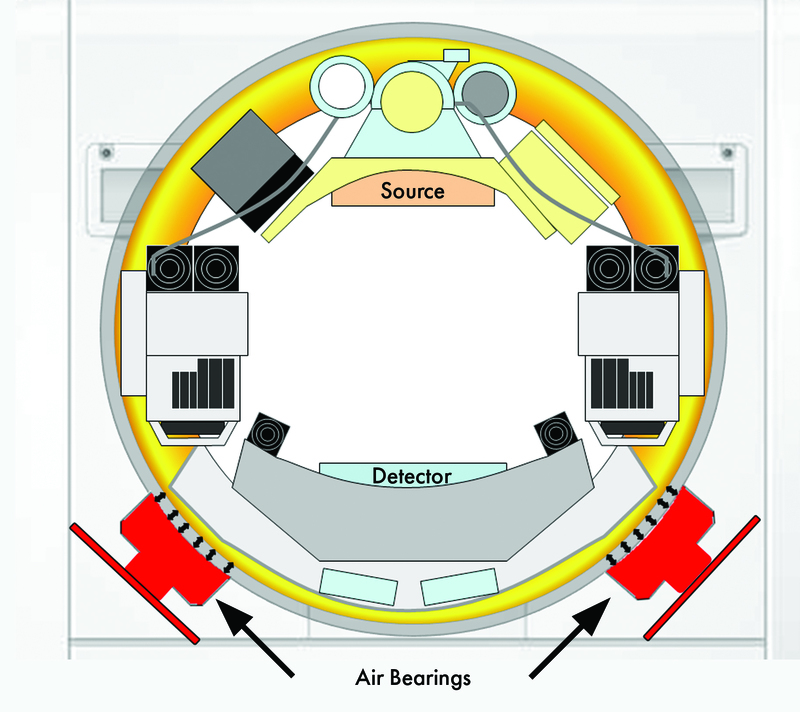 Figure 5 – A typical assembly consists of two radial air bearings (rear) and six axial air bearings (front). The axial bearings mount the same way and are also kinematic with the 3 bearings establishing the vertical plane the same way a three-legged bar stool will not rock. On large rotors the length of the radial air bearings becomes very small percentage of the rotor circumference, this allows surprisingly large mismatches in the relative radius of the air bearings and rotor, so the air bearings and rotors may be sourced though different vendors since matched sets are not necessary. Philips Healthcare started with their fresh design effort early in the 21st century knowing they needed to increase scanner speeds. Air Bearing support had the speed and other advantages they were interested in. 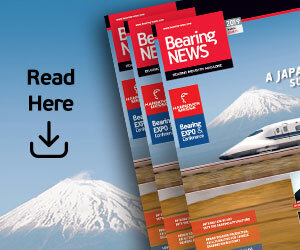 Ultimately, they selected porous carbon air bearing technology from New Way Air Bearings, who worked with them through a six-year development. 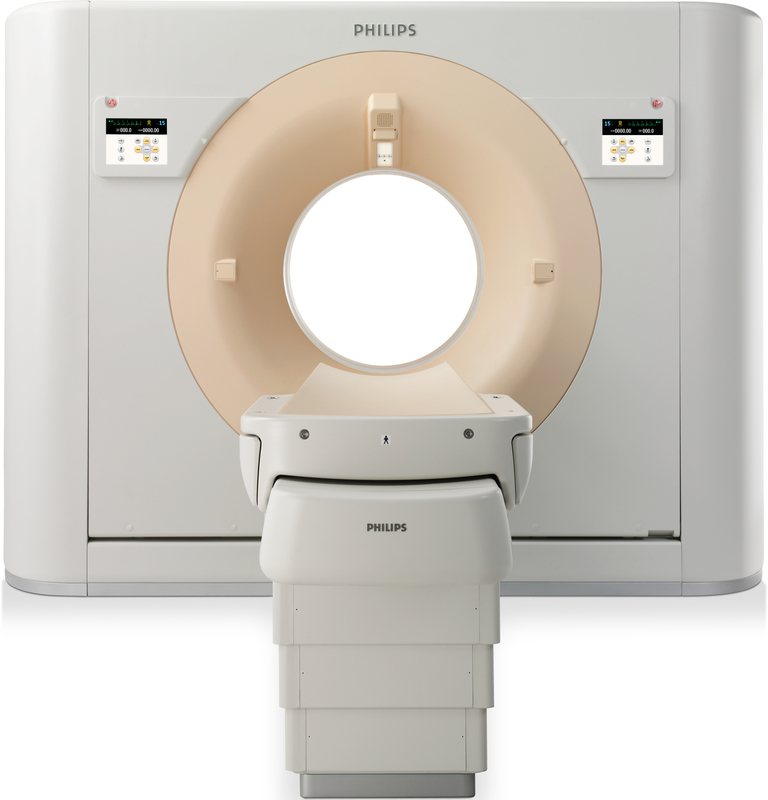 In November 2007, Philips introduced the Brilliance iCT Scanner at the Radiological Society of North America Annual Meeting using “AirGlide” technology. Today, there are over 1,000 Brilliance iCT Scanners in the field using New Way Air Bearings with an excellent reliability record. 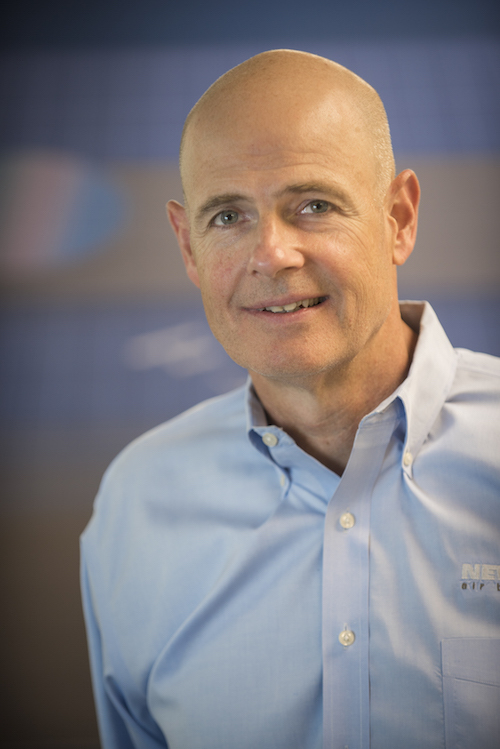 Drew Devitt is the Chairman and CTO of New Way Air Bearings, in Aston, PA.